Peter Gaskell was working with graphene for battery anode applications at McGill University in Montreal while his brother Robert-Eric studied listener perception of sound quality in the Sound Recording department. While the two PhD students discussed their work over beers they realized that graphene might be ideal for membranes in microphones and loudspeakers. Further they hoped that graphene oxide could be used to form sheets large enough to build transducers. The idea was first tested in a ribbon microphone and the brothers wrote a paper for the Audio Engineering Society. Peter’s academic advisor encouraged the pair to file a patent for the idea, and they began to look for funding. After seeing the Beats brand sold to Apple the inspiration came to use headphones as their main offering. Headphones have small audio drives that are relatively easy to make but provide high-fidelity and tightly controlled listening experience. With their company ORA Peter and Robert-Eric are currently running a Kickstarter campaign to fund their graphene headphones. Robert-Eric Gaskell and co-founders Ari Pinkas and Sergii Tutashkonko answered a few questions for us about the development of the headphones. They said that graphene technology can improve cell phone micro speakers, hearing aids or large PA speakers at rock concerts. The makeup of Ora’s proprietary GrapheneQ technology is ninety five percent graphene by weight and the other five percent is made of crosslinkers. Fine tuning the bonds between the graphene layers was critical to keeping the desired balance of high stiffness and low mass. They used calculations centered around the first bending mode of a flat disk, approximated frequencies, and took the five best versions of the material for testing. 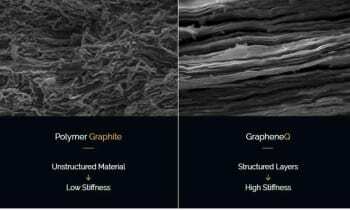 Challenges in design and manufacturing of the headphones came from the graphene itself. Several methods were tested to find the ideal process to take two dimensional graphene and turn it into the cones and domes required for dynamic loudspeakers. Deposition tests eventually yielded a process that found a good mix between reliability and scalability for high volume manufacturing. The headphones themselves run on Bluetooth 4.2 connectivity, have a 3.5 millimeter headphone jack, and can also use a USB-C connector for connection or charging the 3.7 Volt lithium polymer battery. The frequency response is 4 – 63 kiloHertz with 32 Ohms per 40 millimeter driver. The full assembly is 20 x 22 x 8 centimeters and weighs one pound. Graphene has always fascinated me due to its limitless possibilities but frustratingly small catalog of current applications. The Ora campaign for funding is great because of the elegance of the high tech headphone design but also the novel use for graphene. The campaign has successfully met its funding goals and will end on July 17, with first units are expected to ship in March, 2018.